After the gorgeous weekend, I was so ready for it to be spring! And, then I woke up to rain and wind this morning – booo! But, in keeping with the spring spirit (saturday was the first day of spring! 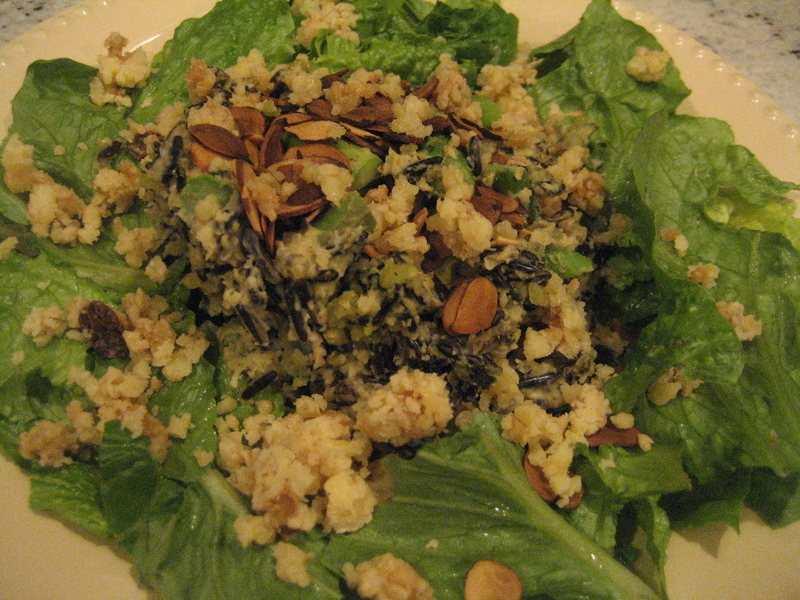 ), I decided to try Heidi Swanson’s Spring Wild Rice Salad tonight for dinner. We just happened to have all of the ingredients on hand. It tasted great, but unfortunately did not look pretty at all! It kind of looked like mush. I was doing some other things while my split peas were cooking, and I think I overcooked them. I just wasn’t in the cooking mood tonight. Luckily, Brant and I both liked the meal, even if it didn’t look pretty, so I’m posting the recipe anyways. 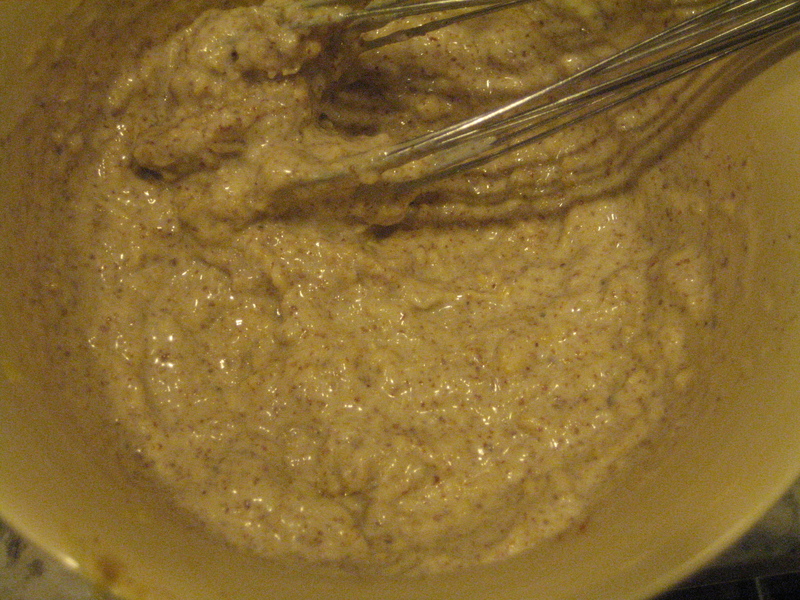 Whisk together the garlic, almond butter, lemon zest and juice, and olive oil. Add the hot water to thin a bit and then the salt. Set aside. Bring a saucepan full of water to a boil. 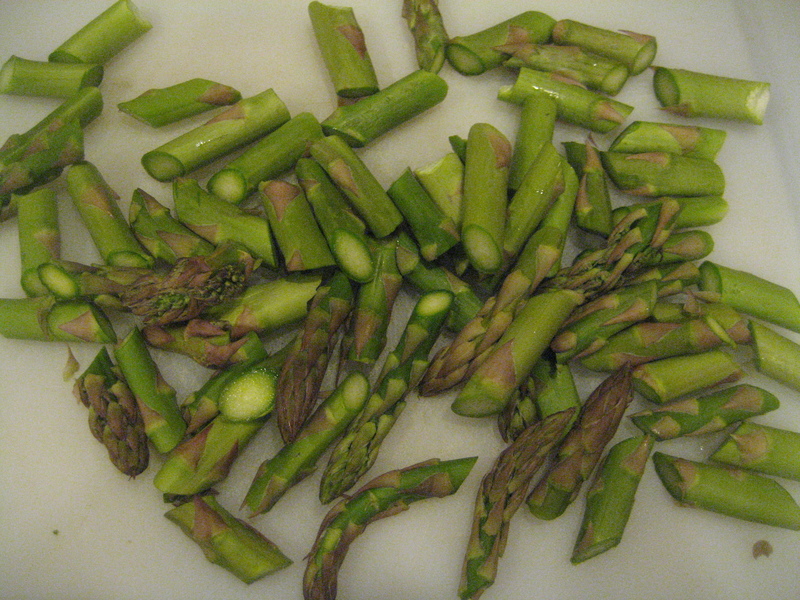 Salt the water and add the asparagus. 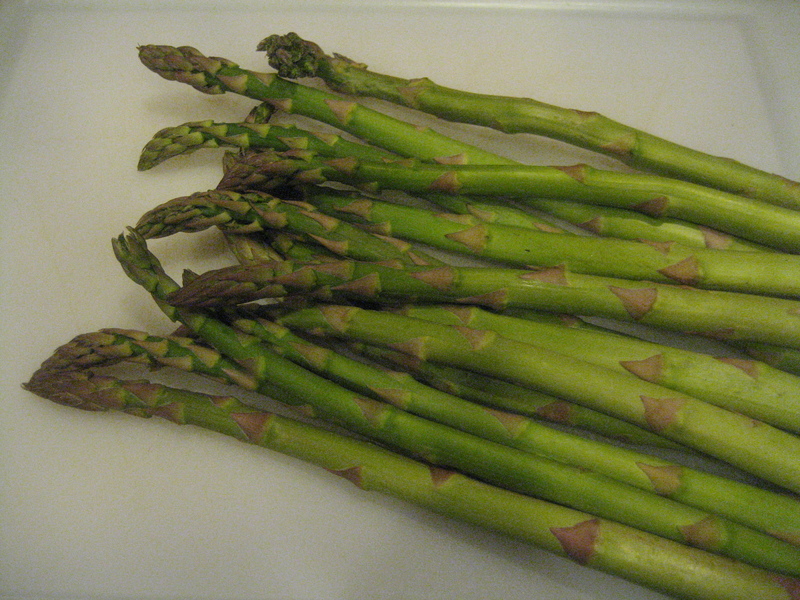 Cook for just a minute – until the asparagus is just bright and tender. Drain and run under cold water to stop the cooking. 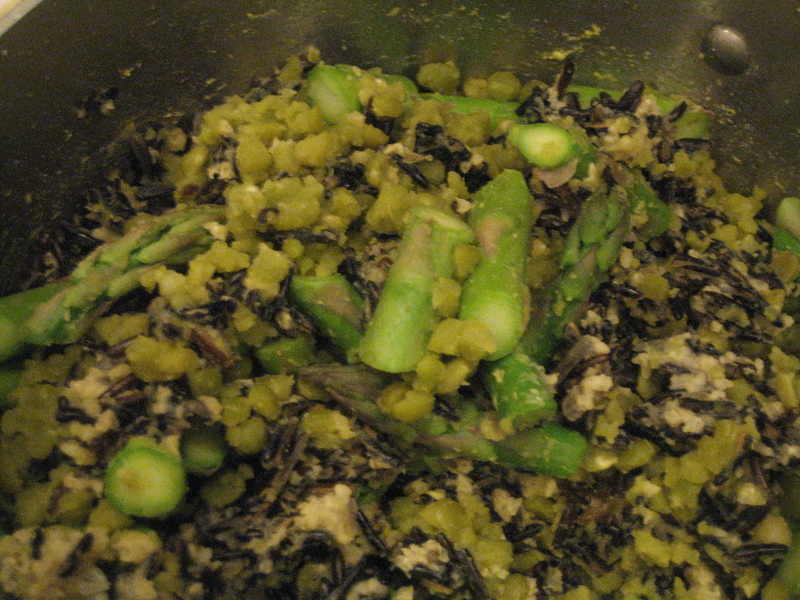 In a large bowl combine the wild rice and millet (which I cooked in a rice cooker), split peas, asparagus, and about half of the almond dressing. Give it a good toss. Add more dressing if needed – i ended up using it all. Taste, and add more salt if needed. 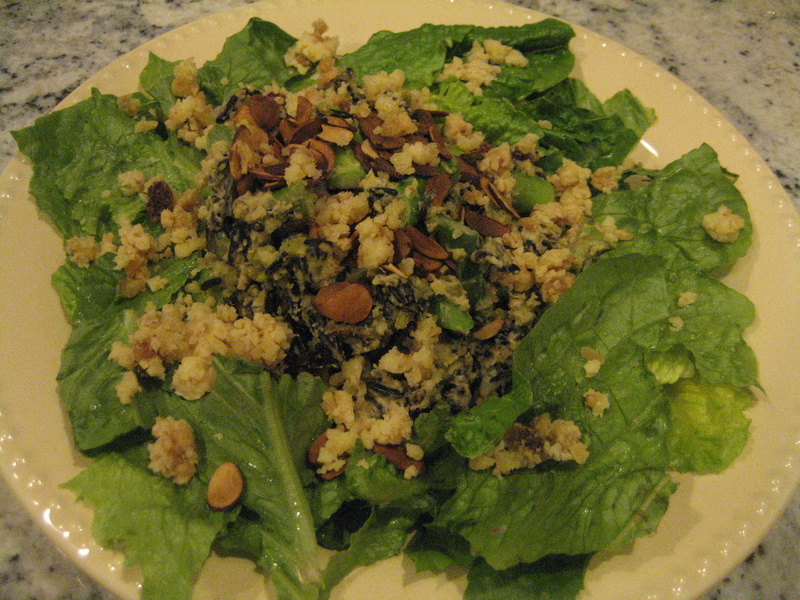 Serve atop a bed of greens, topped with toasted almonds and crumbled cheese. Sorry for the not so pretty photos – I swear the dish tasted good though. The pictures on Heidi’s site are much much nicer. I didn’t take photos of the rest of my eats today because it was honestly pretty boring! I had a big bowl of banana oats with 2 tbsp of chocolate peanut butter for breakfast, and apple for a snack, and the same wrap for lunch as yesterday. Then, some yogurt for a snack before dinner. Pretty uneventful, but I was feeling super hungry from running the NYC half marathon on Sunday. I decided against a workout today, but I did do 30 minutes (10 minutes this morning, 20 minutes tonight) of some Yoga for Runners poses. I feel very stretched now, and my legs were not tight or sore at all today. After dinner, I snacked on my new favorite thing – freeze dried pineapple! YUM! It’s crunchy, instead of chewy – I love it! 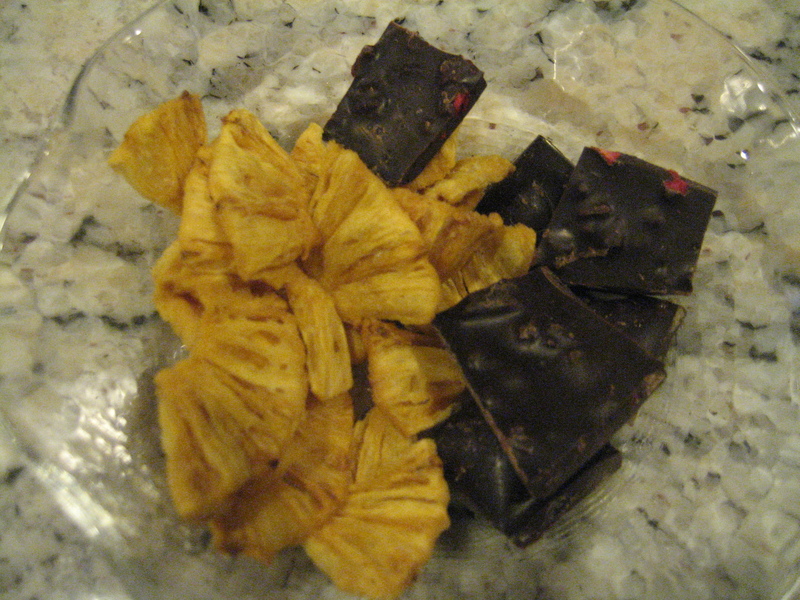 I paired my pineapple with some Dark Chocolate with Raspberries from Chocolove (my favorite chocolate company!). Perfect (and fruity) dessert. I am exhausted! Time for a good night’s sleep! P.S…I updated my Running Page with sample Speedwork Sessions and Fitness Tips today…check it out!